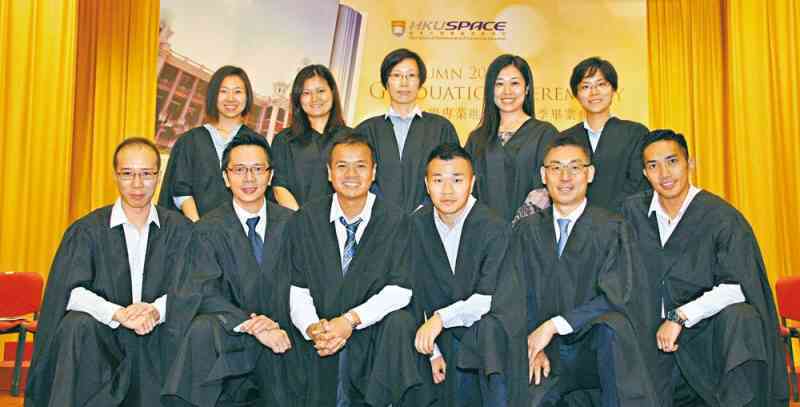 Nineteen members of the Police Negotiation Cadre (PNC) have completed the Postgraduate Diploma in Public Order Studies (Crisis Negotiation) run by the Hong Kong University (HKU) SPACE as the first batch of graduates. The diploma programme is the first in the Force with credit transferal arrangement being awarded Level 6 qualification - equivalent to Master Level - under the Hong Kong Qualifications Framework, marking a key milestone of the professionalism and accreditation of PNC in-house training. Speaking at the officers' graduation ceremony on October 19, HKU SPACE Deputy Director (Academic and Professional Programmes) and Head, College of Humanities and Law, Prof Chan Wing-wah, took the opportunity to express his appreciation to Force members for maintaining law and order and ensuring public safety. He urged the graduates to put what they had learned from the programme into practice and remain steadfast and restrained in face of adversity. The diploma programme commenced in October 2012, consisting five modules, namely Public Order and Disorder, Crisis Management and Adaptive Leadership, Human Rights and Law Enforcement, Contemporary Issues in Crisis Negotiation, and Advanced Professional Practices in Crisis Negotiation. The programme has strengthened the personal development of the graduates and further enhanced the operational effectiveness and efficiency of the PNC. Mr Wong Kwong-hing, the Officer Commanding PNC and adjunct lecturer of the programme, said the accredited programme had enhanced the personal and professional qualities of PNC members, adding that the accreditation status ensures the high standing of the Force in the international law enforcement community as well as amongst the crisis negotiation units around the world.